16 Steak Of The Month Clubs That Will Make You Drool , which offer a greater variety of options other than steak. PPS. If you aren't reverse searing with sous vide, you gotta try it. PPPS. (OK, last one). Steak goes great with wine. Check out this list of red wine clubs. The popularity of this club alone is a reason to try it out. 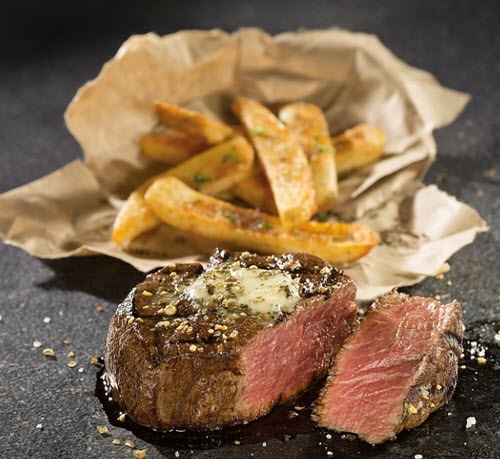 Ohama Steaks is one of the most popular steak clubs and it's easy to see why. You can always expect the best of the best, especially as the company itself focuses on steak. There is one main steak subscription to join, which is the Steak Gift Box. This costs $79.99 per shipment if you're ordering monthly. 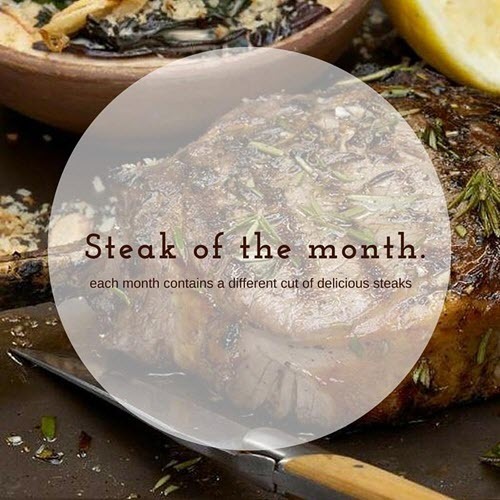 You're receiving different types of steak each month. For example, the March shipment contains 4 filet mignons and 2 ribeyes, while the February version has 6 top sirloins and 4 bacon-wrapped filet mignons. You can also order every 2 months for $109.99 per shipment or every quarter for $149.99 per shipment. The price differences suggest that the less frequent subscriptions contain more meat. Either way, the site has a full list of what you receive and when for each of the versions. This company has some interesting steak club options. The Stock Yards subscriptions are associated with the site Harry & David, which provides some amazing subscription programs. In this case, there are 3 different meat-based options: The Steakhouse Club, Stock Yards Club, and Stock Yards Steak and Wine Club. 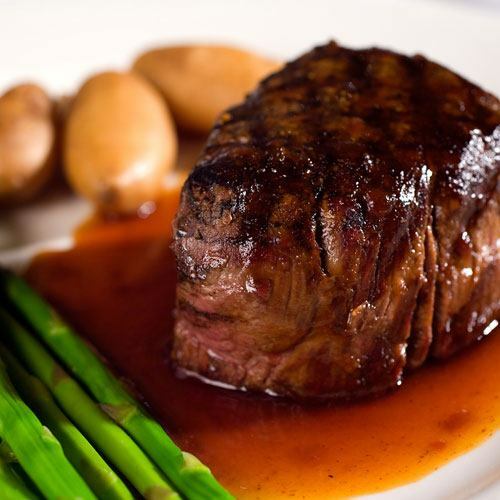 Of these, The Steakhouse Club is the most relevant, offering a selection of different meat products. Despite the name, the club doesn't just provide steak. There are some other types of meat included too, like spiral-sliced ham, oven roasted turkey and pork ribs. There is also a Steak and Wine Club, which is particularly interesting, as few companies offer this combination. The club costs $249.99 for a 3-month subscription, $449.99 for a 6-month version and 799.99 for a full year. Each month provides you with some steaks (normally 2), along with a bottle of Harry & David wine. This subscription provides different steak varieties monthly. 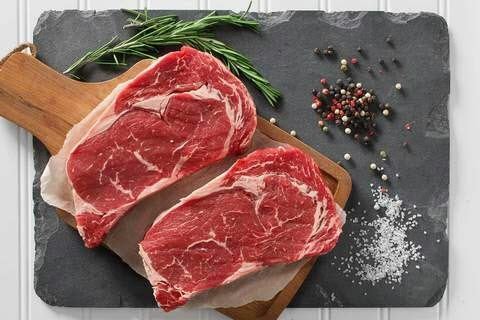 The steak subscription from Heritage Foods really does provide you with just steak every month. You get between 32 ounces and 64 ounces of the meat at a time, which is roughly enough to feed 4 people. One of the most interesting aspects is that the steaks are always different. Various cuts are provided and there is an emphasis on flavor nuances. The meat is also high-quality, coming from family farmers rather than large commercial companies. The subscription costs $145 per month. You simply pay on a month-to-month basis, canceling when you no longer want to be a member. This company specializes in steaks, making them a good choice. Allen Brothers differs from most other steak subscriptions, as you cannot join on a monthly basis. Instead, you can choose between a 6-month gift plan (for $929.95) and a 12-month gift plan (for $1,699.95). Both versions of the plan provide you with different meats each month. 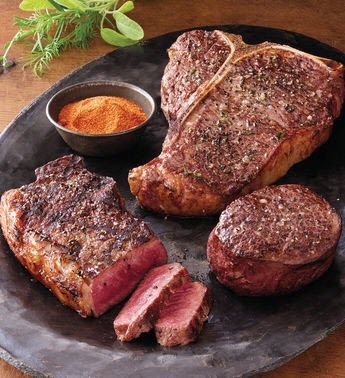 For example, 1 shipment offers 4 prime filets mignon and another has 4 prime porterhouse steaks. The amount of meat varies between the months, influenced by the type of meat that you receive. While the subscription price might seem high, you are getting amazing meat every month. As every steak lover will know, high-quality steak really is worth the price. This company doesn't just focus on steak, their meat is also beer & grass fed. 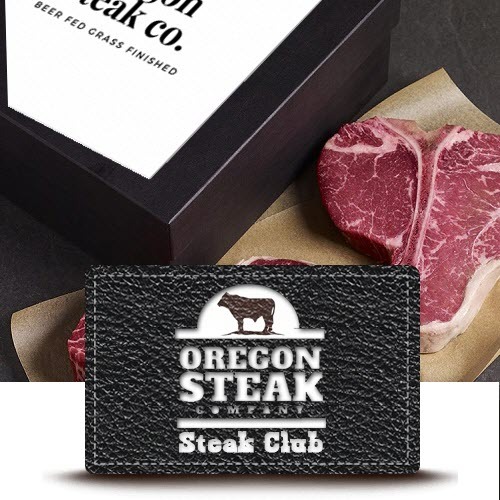 If you want amazing steak, the subscription from Oregon Steak Company is a good choice. The monthly box provides various types of steak each month and some ground beef. For example, the April and October boxes contain 2 top sirloin steaks and 2 pounds of ground beef. Unlike most other clubs, this one rotates through a set schedule each year. You can see exactly what to expect each month by looking at the list on the site. Membership costs between $67.50 and $78.95 per month. This company has 2 different types of steak plan to choose from. 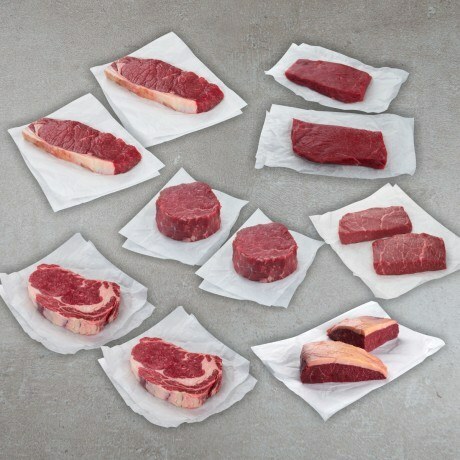 Steak subscriptions are often similar, offering different types of steak from one month to the next. The Chicago Steak Company breaks with this pattern by having 2 different steak clubs. The first of these is the Five Star Reserve Steaks plan. It provides you with USDA prime wet aged steak that is individually wrapped, vacuum sealed and even has its own registration number. Those approaches provide a strong indication of quality. The club costs $999.95 for a 6-month version or $1,799.95 for a 12-month plan. The other option is Premium Angus Beef. This version costs $849.95 for the 6-month version and $1,599.95 for the 12-month version. This time the beef is premium Angus. It has the same focus on quality as the previous version. 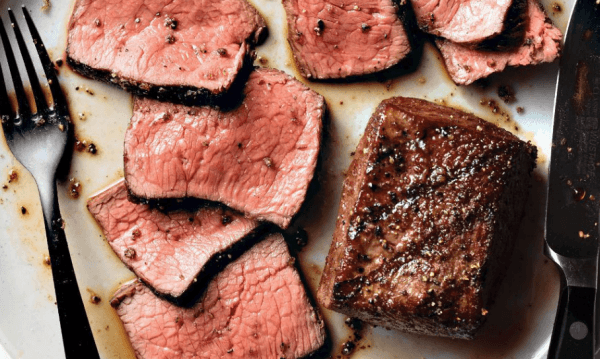 This simple steak club is another option to consider. Catullo Prime Meats provides relatively little information about their steak club. They simply state that you will receive a different cut of steak each month. You pay an unstated shipping fee for the first shipment, but shipping is free for the subsequent months. The monthly club costs $152 per month on subscription. You have the ability to cancel your subscription at any time. Why not sign up and try it out? There are 2 versions with this steak club and they're both appealing. Kansas City Steak Club offers one slightly unusual subscription plan and another that is familiar. The more common one is their Kansas City Steak Favorites Club. 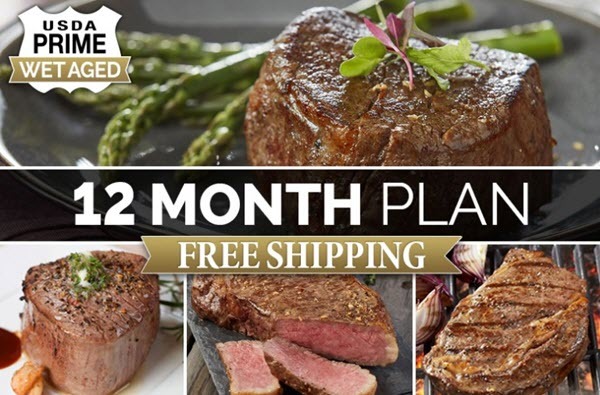 This provides a different type of steak every month (plus a free steak book). 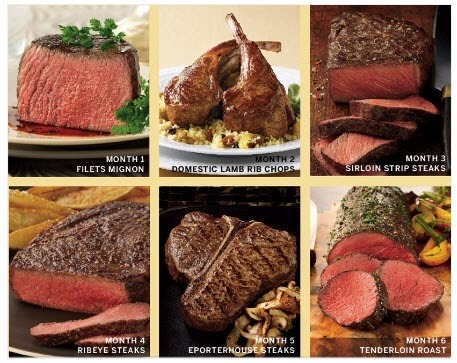 The featured steaks are listed on the company's website. The other option is the Custom Choice Club. As the name suggests, you get to choose the meat that you receive. There is a large selection to choose from, including some that are steak and others that are not. This amount of control is unusual and appealing. Both clubs have a 3-month (for $264.95), 6-month (for $519.95) and a 12-month (for $999.95) version. While this company considers itself to be trusted, it isn't as appealing as many other options. This company is simply called Steak Club. They claim that their Steak of the Month Club has a long history and is the most trusted in the United States. Even if the company has been around for as long as they claim, their reliability is less certain. Regardless, this club is another way to get steak delivered, so it's worth talking about. Most versions of the club provide 2 steaks per month, with the price varying based on the length. For example, a 4-month version costs $269.99, while an 11-month version is $769.99. There are also other options, like organic steak and Japanese Wagyu steak. In each case, the site provides pricing details and a list of the types of steak that you can expect each month. While this company doesn't always offer a subscription program, they are still worth checking out. 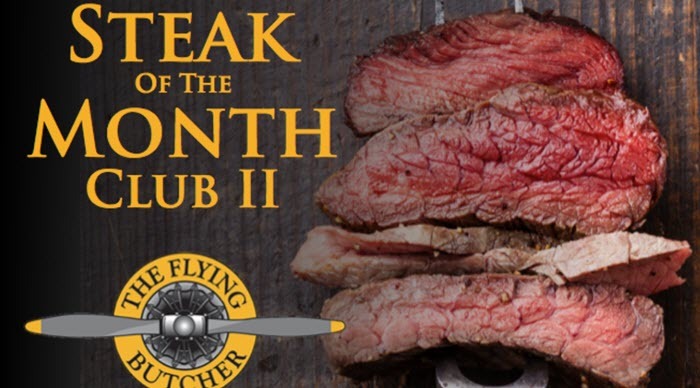 The Flying Butcher is a local company that periodically offers a Steak of the Month Club. When this is running, it provides a different type of steak each month. 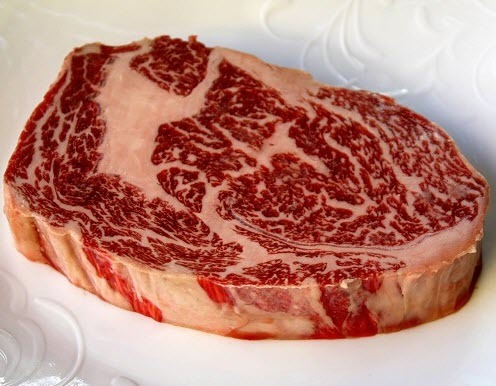 For example, you might get 10 ounces of filet mignon one month, 20 ounces of skirt steak another and 20 ounces of dry aged ribeye later in the year. The subscription starts at $109.99. It can be ordered in either 6-month or 12-month packages. Because the club isn't always offered, you may need to put yourself on their email list. Doing so means that they can send a message when the club reopens. 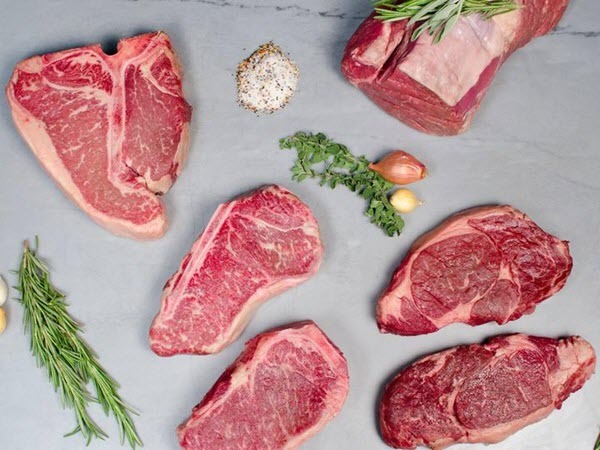 This company has a strong emphasis on quality – providing grass-fed organic steaks. If you want the best of the best, Greensbury is the ideal company to consider. 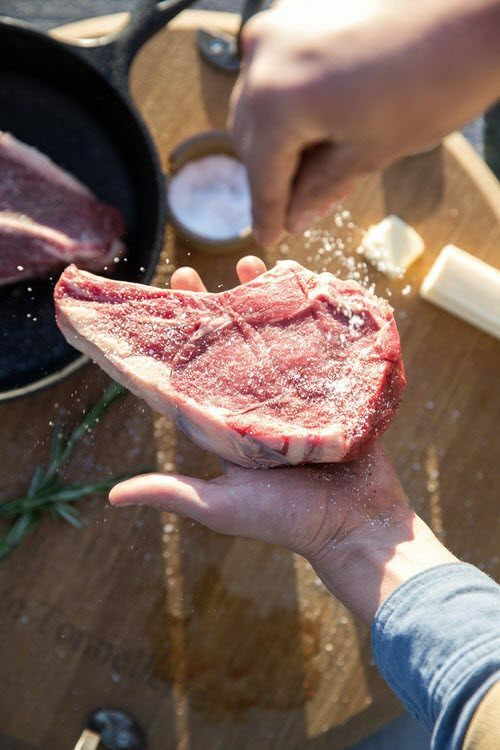 They provide grass-fed organic steaks that are also GMO-free and antibiotic-free. Greensbury doesn't offer a steak club in the traditional sense. Steaks are purchased separately instead. The company is still relevant because you can subscribe to receive any of the steaks on a regular basis. A subscription saves you 5% on the regular price. This style makes Greensbury a good choice if you like some types of steak and not others. At least this way, you can be certain that you're getting the steak you want. Steak is one of the many different offerings from Amazing Clubs. Amazing Clubs is one of the most versatile subscription companies in the marketplace. They offer roughly 40 different clubs. Some of these are fairly typical, while others are unusual (like a lobster club). Their Sirloin Club provides 4 aged steaks every month. These are always sent fresh and have never been frozen. You also get to choose the type of steak you receive. Your options are 6-ounce filet mignons, 8-ounce boneless ribeyes, 10-ounce boneless strips or ‘surprise me’. The surprise me option provides you with 2 varieties of steak (you still receive 4 steaks in total each month). A subscription costs $99.95 per month for most variations. This will sometimes drop down to $98.95 per month or $97.95 per month when the longer-term subscriptions are on sale. This UK-based company is an alternative monthly subscription. Most of the companies featured in this list are from the United States. Yumbles is an exception, as they operate in the UK. The club currently only ships out to the UK mainland with free standard delivery on all orders. This makes the club perfect for anyone living in the shipping area. The club delivers 2 steaks each month. The type of steak changes each time. 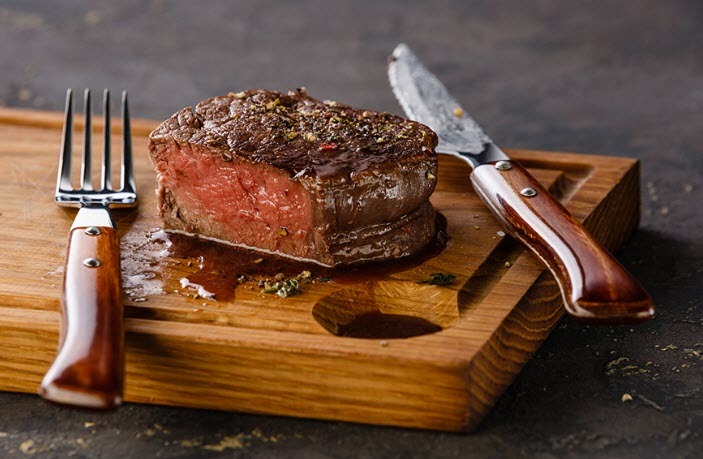 Examples include sirloin steaks, picanha steaks and rump pave steaks. Your steaks are always sent fresh and you can freeze them if you want to. The 3-month version of the club costs £70, while the 6-month version costs £140. Here’s a meat club with 3 different versions to select from. Lavaca Meat has more subscription variations than most other companies. Their first option is a Prime Subscription. This provides prime steaks each month, along with 2 pounds of signature steakburger from the company. You can choose between 2 or 4 steaks per month. Prices vary slightly, but the 2-steak version costs around $69.99 per month, while the 4-steak version costs $125.99 monthly. Another option is the Top Tier Choice Subscription. This version costs $59.99 for the 2-steak version and $115.99 for the 4-steak version. Once again, you receive 2 pounds of the steakburger from the company. The final option is the Favorite Subscriptions. These are a little different, as you’re able to choose the type of steak that you receive. The Prime Steak version starts at $17.99, while the Top Tier version starts at $15.99. In both cases, the price depends on how many steaks you want per month and the specific cut that you choose. This subscription uses drop locations, rather than delivering directly. Shire Beef is a smaller company than many others on this list. As a result, they don’t ship directly to customers. Instead, they have drop locations in Vermont, Massachusetts and New York. Shire Beef also promises to work with customers to host more drop locations. The club itself provides you with roughly 5 pounds of meat each month. This normally averages out to around 5 or 6 individual steaks. Membership costs $99 per month. A 6-month membership costs $595 (an average of around $96 per month) and a 12-month membership costs $999 (an average of around $83 per month). This popular subscription program doesn’t just focus on steak. 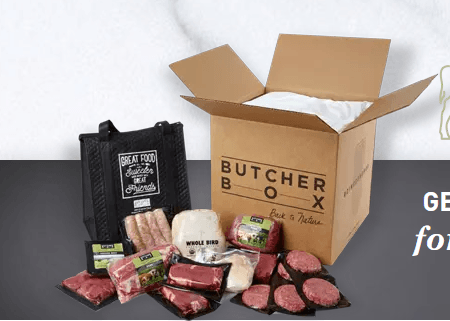 Butcher Box doesn’t provide a steak subscription program like the other companies on this list. Instead, you are able to subscribe to a monthly meat box. The most relevant of these is the Custom Box. This allows you to choose the cuts of meat that you’ll get each month. The first step is to select the box size. The Classic Box offers 9 to 14 pounds of meat, for $149 per month. The Big Box offers 18 to 26 pounds of meat, for $270 per month. You can simply select the steaks that you want from the order page. You’re not locked into a single selection either. Butcher Box has an accounts management page that allows you to change your meat selections from one month to the next. You can also change the frequency and size of the box.